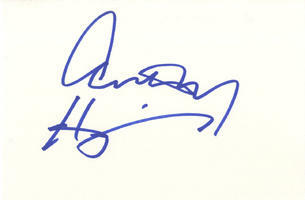 This is an In Person signed white card 6" x 4" by the Welsh Actor of Stage, Film and Television. Sir Philip Anthony Hopkins, CBE (born 31 December 1937) is a Welsh actor of film, stage, and television, and a composer. Considered to be one of the greatest living actors, Hopkins is perhaps best known for his portrayal of Hannibal Lecter in The Silence of the Lambs, its sequel Hannibal and the prequel Red Dragon. Other prominent film credits include The Mask of Zorro, Meet Joe Black, The Lion in Winter, Magic, The Elephant Man, 84 Charing Cross Road, Dracula, Legends of the Fall, The Remains of the Day, Amistad, Nixon, The World's Fastest Indian, and Fracture. Hopkins was born and brought up in Wales. Retaining his British citizenship, he became a U.S. citizen on 12 April 2000. Hopkins' films have spanned a wide variety of genres, from family films to horror. As well as his Academy Award, Hopkins has also won three BAFTA Awards, two Emmys and the Cecil B. DeMille Golden Globe Award. Hopkins was knighted by Queen Elizabeth II in 1993 for services to the arts. He received a star on the Hollywood Walk of Fame in 2003, and was made a Fellow of the British Academy of Film and Television Arts in 2008.